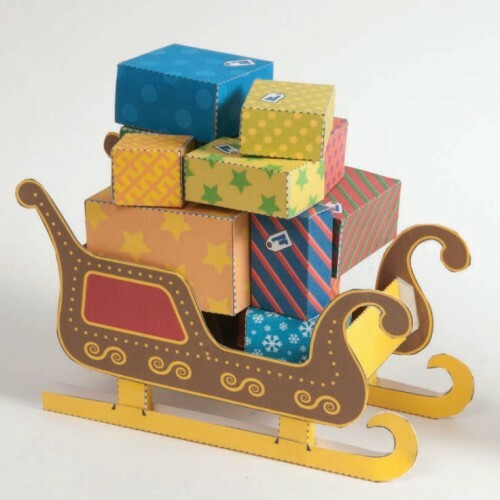 This printable papercraft Santa sleigh comes complete with all the presents shown. I think it would be fun to build this for a friend and actually put a small gift inside each one of the tiny boxes. The PDF template for the sleigh is offered by the Brother Company as a free download to promote their color printers. Check out their other Christmas papecraft while you are there! Sephiroth, a popular antagonist in the Final Fantasy extended universe, is immediately recognizable by the seven foot long kantana blade he wields. 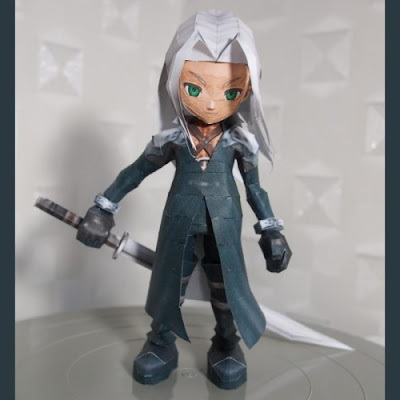 This chibi paper model of Sephiroth was created by Paper Juke. A Pepakura PDO template for the model may be downloaded here. Sephiroth's first appearance was in the 1997 Final Fantasy VII video game. Papercraft build photo by Sinsis. 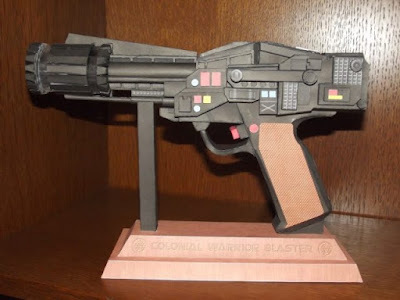 Here's a blast from the past (no pun intended): a full size paper model of a Colonial blaster pistol from the original Battlestar Galactica television series. The model is somewhat complicated to build as some of the parts in the muzzle are constructed from sheets of clear plastic, but the end result is marvelous! The PDF template for the gun was created by Marcell von dem Berge and may be downloaded at Steve's Paper. Battlestar Galactica aired on ABC for a single season which began in 1978. 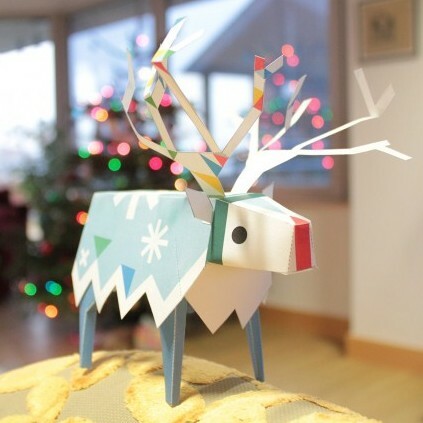 I like the geometric quality of this Christmas reindeer papercraft. The color is nice too, especially the bits of color added to the antlers. The reindeer was offered as a free download by Media Molecule during the 2012 holiday season. Fortunately, the template is still available today and may be downloaded here. The Joker is one of the most iconic comic book characters in the world. He is the very antithesis of his archenemy, Batman. 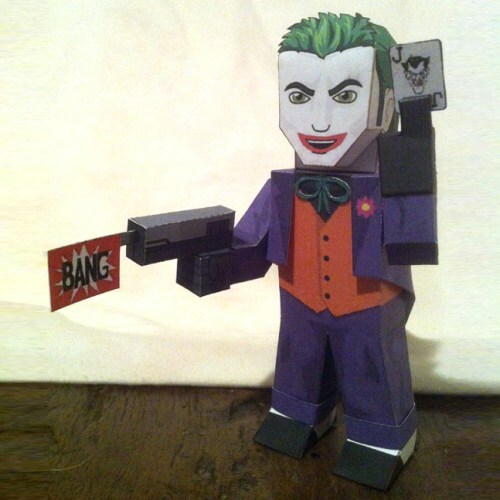 This fan-made paper model of the Joker was created by DeviantART member Wackywelsh. A printable PDF may be downloaded here. Wackywelsh based his model on a template developed by Xavier Gale-Sides. Previously posted superhero papercraft in this style include: The Avengers, The X-Men, Loki, Doctor Octopus, The New Mutants, Superman and Supergirl. Actors Benedict Cumberbatch and Martin Freeman play Sherlock Holmes and Doctor Watson in the popular BBC television series, Sherlock. As part of a "Let's Draw Sherlock" project on Tumblr, Bluebell of Baker Street created paper dolls of the two detectives. Each doll comes with five changes of clothes. 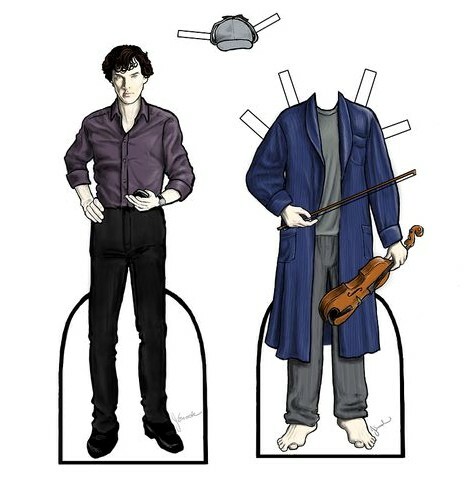 A download of the printable dolls may be found here. Sherlock Season 4 is scheduled to begin filming in Spring 2016. In the upcoming Star Wars: Episode VII movie, a new droid by the name of BB-8 will be introduced. BB-8 is known to be in Episode VII because he made an appearance in the very first teaser trailer for the film. Like R2-D2, BB-8 is an astromech droid, a type of robot who functions as both a mechanic and a co-pilot for certain spacecraft in the Star Wars universe. 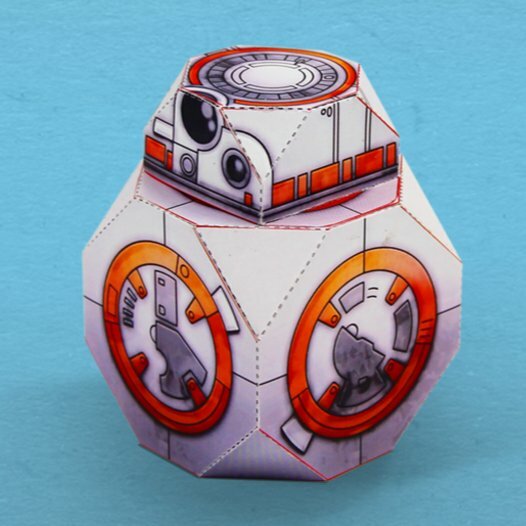 This printable paper toy BB-8 was created by Fold Up Toys and may be downloaded here. Episode VII is scheduled to be released on December 18! 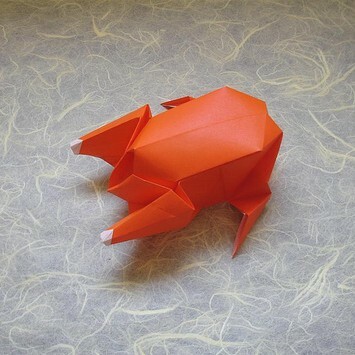 When I first came across this origami, the first thought that came to my mind was: Thanksgiving turkey. However, as I discovered later, it is not an origami turkey. It's a roasted chicken! Be that as it may, it still works well as a Thanksgiving decoration. The crease pattern for the turkey, er I mean chicken, was created by Joseph Wu and may be downloaded here. Build photo by Shuki Kato. Dragons play a significant role in the 1999 video game, Drakan: Order of the Flame. In the game, a young woman named Rynn and her companion, a red dragon named Arokh, fight to free Rynn's brother from the clutches of an evil sorcerer. This papercraft dragon designed by DeviantART member Metalfist0 is based on a 3D model from Drakan. A Pepakura PDO template for the model may be downloaded here. As far as dragon paper models go, I consider this model to be intermediate difficulty. Looking for a simple dragon model? Try this 2.5D dragon model. Looking for something challenging? 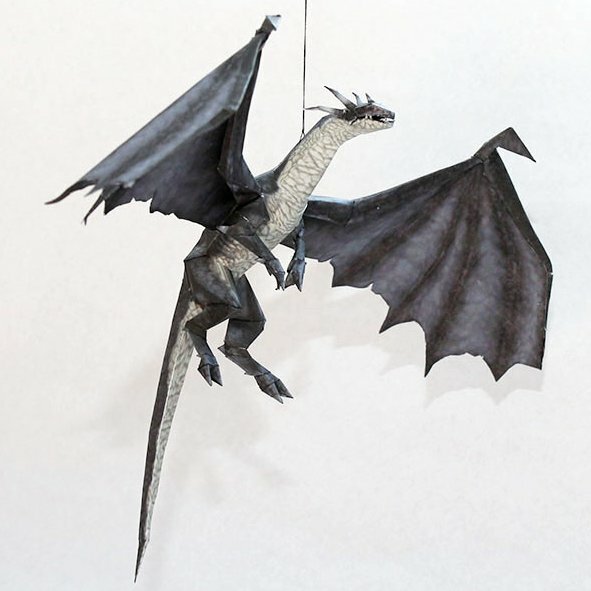 Try this Skyrim frost dragon papercraft! Remember, remember the fifth of November... is the anniversary of Tektonten Papercraft! Yes, seven years ago today I began blogging about the wonderful world of papercraft. Today's photo features four of my pop culture paper models from years gone by. 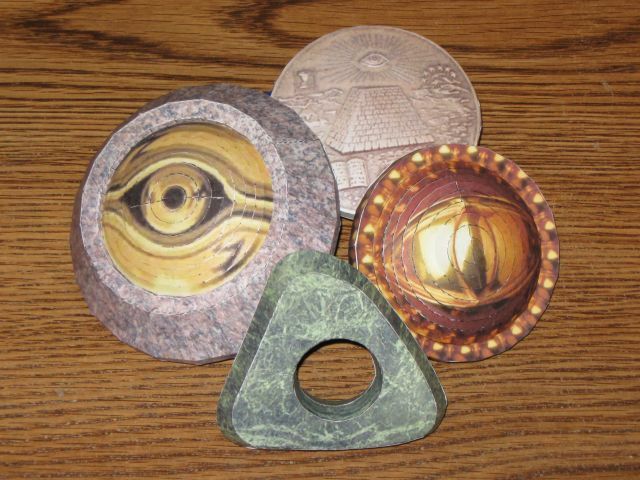 Each one has something to do with an eye. Starting on the left and going clockwise there is the Millennium Eye from Yu-Gi-Oh (2011), the masonic medallion (with Eye of Providence) from National Treasure (2009), the Eye of Agamotto from the Marvel comic book Doctor Strange (2009), and lastly there is the seeing stone from Coraline (2009). Here's thanks to each and every person who has visited Tektonten Papercraft in the past seven years. I couldn't have made it this far without you! Halloween is past, but today marks the third day of El Día de Muertos (The Day of the Dead). The Day of the Dead is a Mexican holiday when prayers are said for deceased family and friends. 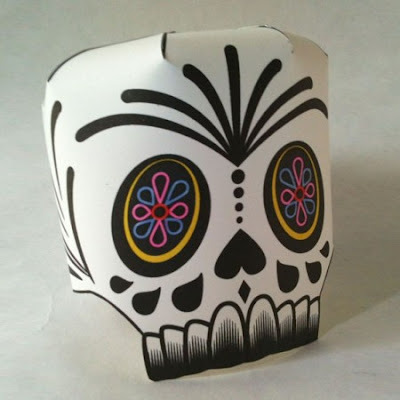 This papercraft skull was inspired by traditional Mexican decorations displayed this time of year. Creator Jonny Chiba intended for the skull to be used as a decortation for both Halloween and El Dia de Muertos. The template for the skull (available here) is black and white and may be colored however you wish.